The latest issue of Medical History is dedicated to celebrating the thirtieth anniversary of Roy Porter’s article “The Patient’s View. Doing Medical History from Below” (Theory and Society, 1985, vol. 14, no 2, 175‑198). 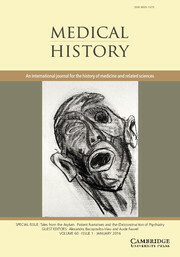 The issue is guest edited by Alexandra Bacopoulos-Viau, one of the editors of h-madness and Aude Fauvel and contains several articles dedicated to the history of psychiatry. This past year marked the thirtieth anniversary of Roy Porter’s seminal 1985 article, ‘The Patient’s View: Doing Medical History from Below’. Few works in the history of medicine have received so enthusiastic a reception. Porter’s call to reclaim the voice of the voiceless has had an extraordinary echo, becoming not only a necessary reference but also a classic trope. This is especially the case among historians of psychiatry. In a field where patient narratives have long formed their own sub-genre, shedding light on these hitherto unheard stories taps into popular fantasies probed by Porter himself—images of gothic madhouses and their gloomy inhabitants; whispers and cries; dark corridors encased in windowless walls, their interiors mirroring the mind gone astray. So ubiquitous is this imagined space that some have recently proposed to create an independent research area dedicated to ‘Mad Studies’. Fetishized, mythicized, ostracised, the psychiatric patient has emerged as an unlikely protagonist, capturing the scholarly, cultural and artistic imagination alike. Yet recent assessments suggest that Porter’s call has not fully been heard. The history of the patient remains ‘curiously underwritten’ in several areas, some have claimed. Others have maintained that on a conceptual level, ‘the history of the patient’s view is as undeveloped now as it was back in the mid-1980s.’ In view of historians of psychiatry’s special love affair with the world of their protagonists, a critical review of these recent developments seems all the more pertinent. This special edition explores the varied ways in which patients’ voices have guided psychiatry’s construction, deconstruction and reconstruction from 1800 to the present. In this respect, the thirtieth anniversary of Porter’s seminal article acts as an opportune occasion to reexamine the field using fresh historical and historiographical perspectives. In what ways have historians of psychiatry taken on the project of a history ‘from below’? How have they turned such tales into objects of study? What do their works reveal? And how has this focus on patient narratives shaped our understanding of the processes by which mental illness is understood and treated in the twenty-first century? Friedrich Krauß (1791–1868) is the author of Nothschrei eines Magnetisch-Vergifteten [Cry of Distress by a Victim of Magnetic Poisoning] (1852), which has been considered one of the most comprehensive self-narratives of madness published in the German language. In this 1018-page work Krauß documents his acute fears of ‘mesmerist’ influence and persecution, his detainment in an Antwerp asylum and his encounter with various illustrious physicians across Europe. Though in many ways comparable to other prominent nineteenth-century first-person accounts (eg. John Thomas Perceval’s 1838 Narrative of the Treatment Experienced by a Gentleman or Daniel Paul Schreber’s 1903 Memoirs of my Nervous Illness), Krauß’s story has received comparatively little scholarly attention. This is especially the case in the English-speaking world. In this article I reconstruct Krauß’s biography by emphasising his relationship with physicians and his under-explored stay at the asylum. I then investigate the ways in which Krauß appropriated nascent theories about ‘animal magnetism’ to cope with his disturbing experiences. Finally, I address Krauß’s recently discovered calligraphic oeuvre, which bears traces of his typical fears all the while showcasing his artistic skills. By moving away from the predominantly clinical perspective that has characterised earlier studies, this article reveals how Friedrich Krauß sought to make sense of his experience by selectively appropriating both orthodox and non-orthodox forms of medical knowledge. In so doing, it highlights the mutual interaction of discourses ‘from above’ and ‘from below’ as well as the influence of broader cultural forces on conceptions of self and illness during that seminal period. In his 1895 textbook, Mental Physiology, Bethlem Royal Hospital physician Theo Hyslop acknowledged the assistance of three fellow hospital residents. One was a junior colleague. The other two were both patients: Walter Abraham Haigh and Henry Francis Harding. Haigh was also thanked in former superintendent George Savage’s book Insanity and Allied Neuroses (1884). In neither instance were the patients identified as such. This begs the question: what role did Haigh and Harding play in asylum theory and practice? And how did these two men interpret their experiences, both within and outside the asylum? By focusing on Haigh and Harding’s unusual status, this paper argues that the notion of nineteenth-century ‘asylum patient’ needs to be investigated by paying close attention to specific national and institutional circumstances. Exploring Haigh and Harding’s active engagement with their physicians provides insight into this lesser-known aspect of psychiatry’s history. Their experience suggests that, in some instances, representations of madness at that period were the product of a two-way process of negotiation between alienist and patient. Patients, in other words, were not always mere victims of ‘psychiatric power’; they participated in the construction and circulation of medical notions by serving as active intermediaries between medical and lay perceptions of madness. The so-called chemical revolution has produced a vast historiographical corpus. Yet the patient’s voice remains surprisingly absent from these stories. Based on the archives of the Institut de Psychiatrie (Brussels), this paper traces the introduction of Largactil as recounted in patient letters, physician records and nurse notes. The paper thus contributes to the history of therapies from below, but also participates in the historiographical debate about whether the introduction of neuroleptics can indeed be considered a revolution. This article contextualises the production of patient records at Glasgow’s Gartnavel Mental Hospital between 1921 and 1932. Following his appointment as asylum superintendent in 1921, psychiatrist David Kennedy Henderson sought to introduce a so-called dynamic approach to mental health care. He did so, primarily, by encouraging patients to reveal their inner lives through their own language and own understanding of their illness. To this effect, Henderson implemented several techniques devised to gather as much information as possible about patients. He notably established routine ‘staff meetings’ in which a psychiatrist directed questions towards a patient while a stenographer recorded word-for-word the conversation that passed between the two parties. As a result, the records compiled at Gartnavel under Henderson’s guidance offer a unique window into the various strategies deployed by patients, but also allow physicians and hospital staff to negotiate their place amidst these clinical encounters. In this paper, I analyse the production of patient narratives in these materials. The article begins with Henderson’s articulation of his ‘dynamic’ psychotherapeutic method, before proceeding to an in-depth hermeneutic investigation into samples of Gartnavel’s case notes and staff meeting transcripts. In the process, patient–psychiatrist relationships are revealed to be mutually dependent and interrelated subjects of historical enquiry rather than as distinct entities. This study highlights the multi-vocal nature of the construction of stories ‘from below’ and interrogates their subsequent appropriation by historians. This study focuses on ‘manufactured mentally ill’ (bei jingshenbing, 被精神病) individuals in post-socialist China. In Chinese society, bei jingshenbing is a neologistic catchphrase that refers to someone who has been misidentified as exhibiting symptoms of mental illness and has been admitted to a mental hospital. Specifically, it refers to those individuals who were subjected to unnecessary psychiatric treatment during the first decade of the twenty-first century. Based on archival analysis and ethnographic fieldwork, this study addresses the ways in which the voices of bei jingshenbing victims and those who support them reveal China’s experiences with psychiatric modernity. It also discusses the active role of these individuals in knowledge production, medical policymaking, and the implications for reforming the psychiatric and mental health systems in post-socialist China.